A quick transformation of a sloping garden in Clifford. 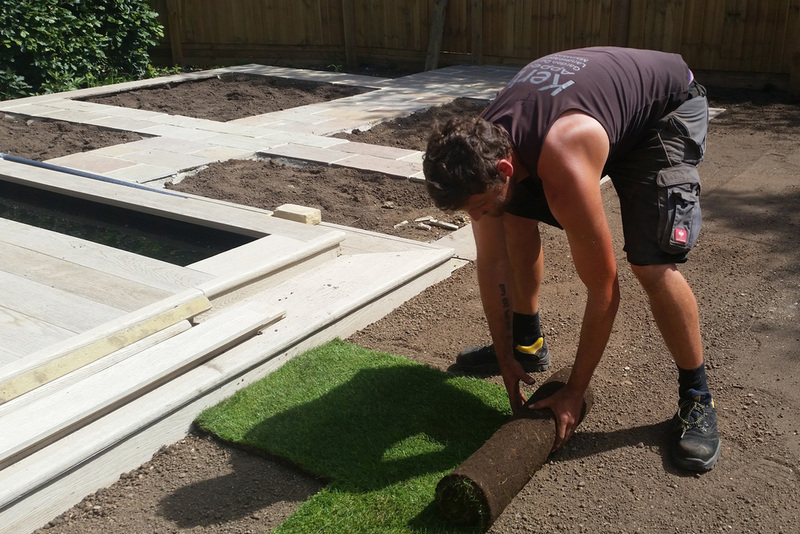 We levelled the site with sleeper beds, laid a curved 'mint fossil' Indian sandstone patio and laid a new flat lawn for the grandkids to play on. 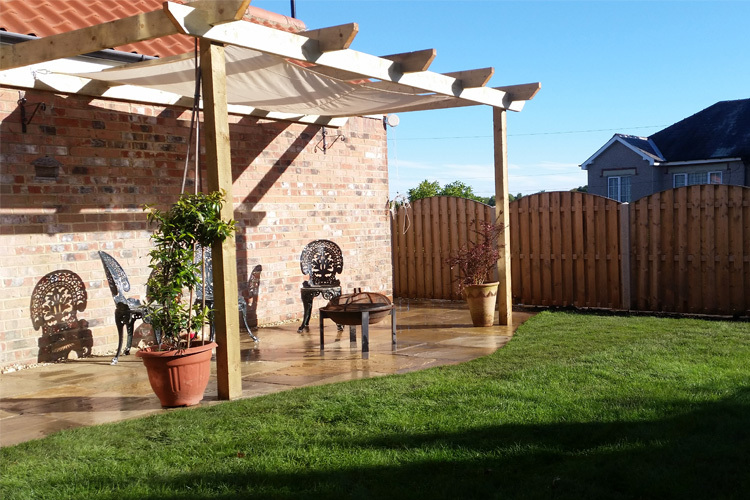 The focal point of the garden is the pergola over the patio to which we fitted a shade sail for those super hot British summer days!! We helped Tadcaster East Primary School set up an after school gardening club back in spring by arranging for a donation of top soil and supplying the children with plenty of compost. The club is still growing strong! Maybe we helped sow a seed for a future employee! There is no stopping us! It has become apparent that Andy has been working with a broken ankle for the last 7 weeks, showing true dedication to the customers and the landscaping jobs. What we've been up to this week! Beautiful weather - non stop working - but enjoying every moment! It's all starting to come together now... the electrician is working on the lighting, the paving is nearly finished and the levels just need tweaking! Finished photos to follow once the lawn and plants are in. Watch this space! We've been putting our skills to all sorts of challenges this week - at a mid-terrace house in Meanwood Park we transformed an untidy, small sloping front yard into a beautiful, functional space, that is the envy of all the neighbours! Welcome to the latest member of the Kerb Appeal family! Welcome to the latest member of the Kerb Appeal family. Penelope Rose Moss "Penny" was born at 9.34am on Sat 4th April weighing 6lb 8. Mum and baby both doing well and dad is very proud!! Day 1... ugly conifer hedge chopped down and disposed of. Day 1 cont... stumps ground out and terrible soil removed. Day 2... quality top soil added and stunning 2.5m tall Yews planted to create an instant hedge.